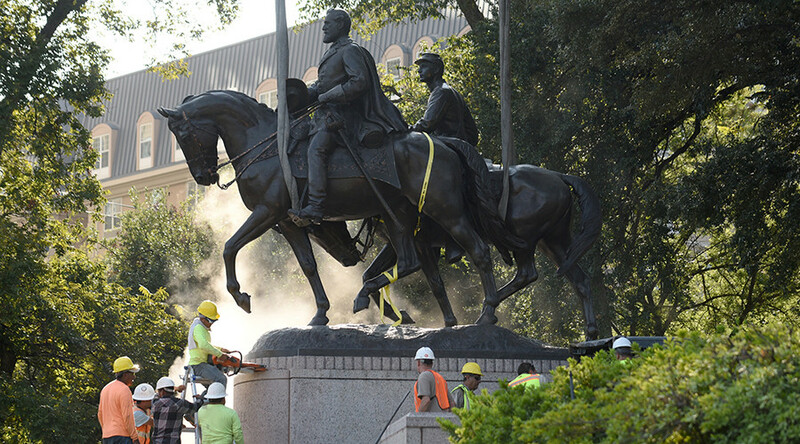 City contractors in Dallas, Texas removed a statue of Robert E. Lee from the city park named for the Confederate general, as heavily armed police provided security in the early morning hours. A crane removed the 14-foot, 6-ton statue, which featured the Civil War commander astride his horse Traveller and accompanied by a young soldier, at 4 am local time on Thursday, according to AP. The statue has been moved to an undisclosed location, until a Confederate monuments task force can recommend a new home for it. Chris Reid, 36, a delivery driver, observed the removal. He hadn’t known what the statue commemorated but once he learned he wanted to see it removed, the Dallas Morning News reported. Supporters of the monument said they were sad to see it go, and that the sculpture had earned its place in Dallas history. President Franklin Delano Roosevelt dedicated the statute in 1936, as part of the Texas Centennial celebration. He praised Lee as “one of the greatest American Christians and one of our greatest American gentlemen,” according to the Morning News. The Dallas city council voted to remove the statue from the Robert E. Lee Park on September 6, in a unanimous vote. The effort was met with a series of delays, including a brief court stay obtained by a pro-Confederacy group. Plans to remove the statue on September 10 were disrupted when the crane dispatched to the park got involved in a traffic accident. A tractor-trailer crashed into the crane as it was exiting the freeway, killing the truck driver. City officials had trouble finding a second crane, since a lot of the construction equipment in Texas has been dispatched to Houston for recovery efforts after Hurricane Harvey. A group calling itself ‘This is Texas Freedom Force,’ planned to gather on Saturday to protest the plans to remove the monument. 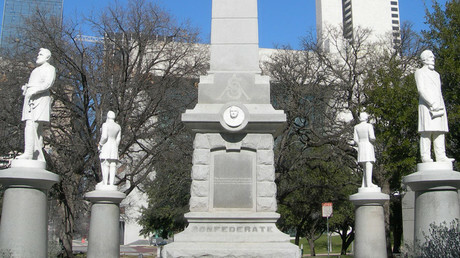 In early August, protesters from both sides came face-to-face after activists called on city officials to take down the Confederate War Memorial in downtown Dallas. That monument includes a 60-ft granite and marble pillar topped by a Confederate soldier, and surrounded by four shorter plinths with statues of Confederate leaders – General Robert E. Lee, General Thomas ‘Stonewall’ Jackson, General Albert Sidney Johnston, and President Jefferson Davis. The demands grew stronger after last month’s violence in Charlottesville, Virginia, at a protest against the proposed removal of a monument to Robert E. Lee.